Screengrab from YouTube, courtesy of Bret Brown at McEnearney AssociatesReal estate agent Bret Brown used a drone to give a bird's-eye view in a video of this home in Bethesda, Maryland. For real estate agents trying to show how beautiful a home is, photos used to be enough. Then came videos and full-blown websites dedicated to a house. Now come the drones. Small, unmanned helicopters with video cameras that are operated remotely are becoming more popular in real estate listings. Unlike a video of a home from ground level, the flying drones can show a house from the sky and almost give the video the feeling that a movie is being filmed there as the drone flies over treetops and gives a panoramic view. It's also a way to see the surrounding property, such as local parks, beaches and how far you live from local shops. Bret Brown, a real estate agent at McEnearney Associates, recently used a drone to give a bird's-eye view of a $3.5 million home on 1.5 acres in Bethesda, Maryland. Homes in the price range aren't selling well there, so Brown says he figured he'd give it a try. He says he at first just wanted to get an overhead shot of the curved driveway, but the drone also took video of the home from above. "The overhead shots were awesome. You just don't get that" any other way, Brown says. "You can go on Google Maps and get an overhead view, but it's not the same thing," he says. The entire video shoot -- which included video from the 18-inch, four-propeller drone and from hand-held video cameras on the ground -- cost $900. Jeff Chiu/The Associated PressA Parrot Bebop drone, fitted with a camera lens, flies during a demonstration in San Francisco on May 8, 2014. But as with many new technologies, legal questions pop up. Flying drones is a commercial grey area for now, with the Federal Aviation Administration saying commercial users must get its authorization, although there aren't regulations yet for "unmanned aerial vehicles," or UAVs, says David Reischer, a lawyer in New York at LegalAdvice.com. Drone photographers try to get around the FAA restrictions by not charging for the flight, but charging for video and photo editing. That may still not qualify as a hobby or recreational use of a drone by the FAA, which has issued warning letters and has tried to fine drone pilots. A federal administrative judge for the National Transportation Safety Board struck down a fine imposed by the FAA against a drone pilot in Virginia. The judge held that there are no UAV regulations that would allow a fine to be imposed, Reischer says. [Updated at 11:55 a.m. EDT with comment from Richard Jost.] When flying a drone inside a house, real estate agents should have no fear of violating FAA regulations since the FAA doesn't have jurisdiction inside, says Richard Jost, an attorney in Las Vegas who specializes in aviation and autonomous systems such as drones. The FAA gets concerned when people fly drones outside, Jost says, and it has backed away from its original position that drones can't be flown for commercial or recreational use. The FAA has fallen back on existing regulations that require a certified aircraft and certified pilot to operate aerial vehicles for commercial use, and the FAA can restrict anyone from flying anything in a hazardous manner, Jost says. Someone flying a drone too close to other homes or people could face this last FAA restriction, he says. "Regardless, real estate agents should be very careful when they use drones to market their properties," Reischer says. "Specifically, real estate marketers should be aware of the risk they are taking if there is an accident with their drones. If a person or property is hurt or damaged as a result of the drone crashing into another object, then traditional tort law principles would apply." "There may be serious damages that result from flying a drone that crashes into another flying vehicle or possibly crash lands onto private property or worse," he says. "A court may determine that there is liability in the event of an accident that is independent of any specific violation imposed by the FAA." Since marketing properties with drones is usually done with the consent of the landowner, there shouldn't be a legal problem in using a drone on your own property. Flying over your neighbor's back yard, however, may lead to a dispute with your neighbor, though how much airspace they own is open to interpretation. "Landowners don't have exclusive rights to airspace above their properties, so marketing with drones can't be classified as trespassing," says Nic Mayne, CEO of Mayne Marketing. "Air is generally treated like a public highway -- the owner could challenge use of the airspace if it infringed on their right to fully enjoy their property, but this would be a hard case to make with drones." The good news for real estate agents trying to avoid upsetting neighbors is that the multi-bladed, tiny choppers are quiet enough that they can fly into a house and across a pool without the neighbors noticing. 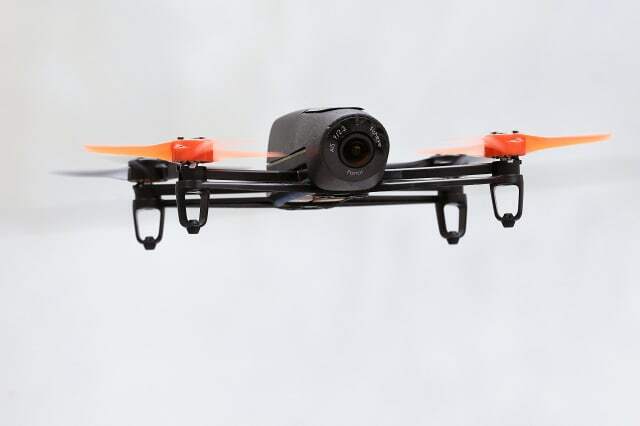 That may allow them to shoot a few minutes of video while escaping the wrath of sunbathing neighbors or the FAA. Screengrab from YouTube, courtesy of Bret Brown at McEnearney AssociatesVideo taken by a drone is a very effective way to show a home's surrounding property, as seen in Brown's video.